Dove recaps Sweet Valley Twins #78: Steven the Zombie, which is offensive to voodoo practitioners, the disabled, Harriet Tubman and Sojourner Truth specifically, and is literally the worst Sweet Valley book Dove has ever read. That includes ithig. 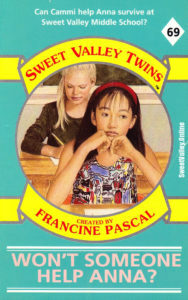 Dove recaps Sweet Valley Twins #75: Jessica and the Earthquake, which unfortunately does not have the same body count as the Sweet Valley High book called Earthquake. 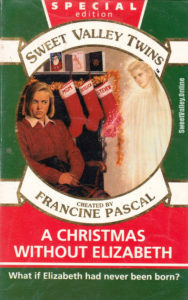 Raven recaps Sweet Valley Twins Magna Edition #2: A Christmas Without Elizabeth, in which Elizabeth Lassos the Moon. 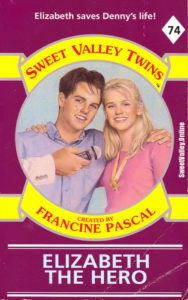 Merry Chrismas, Sweet Valley! 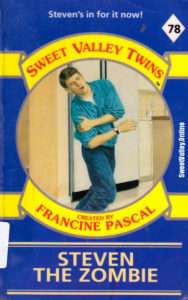 Raven recaps sweet Valley Twins #74: Elizabeth the Hero, in which Elizabeth saves Denny Jacobson's life over and over again, yet no one thinks to stab Steven in the face. 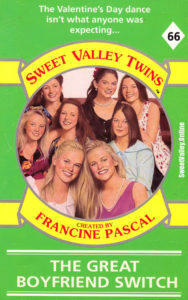 Dove recaps Sweet Valley Twins #71: Jessica Saves the Trees wherein #BestJess attempts to save the trees, Elizabeth is genuinely useless, facts are a last resort. 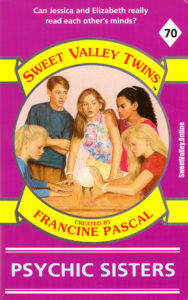 Raven recaps Sweet Valley Twins #70: Psychic Sisters. If the twins COULD read minds, Steven would be in jail. Raven recaps Sweet Valley Twins #69: Won't Someone Help Anna? There's a new girl in town, and she's deaf. BURN HER! BURN THE WITCH! Raven recaps The Great Boyfriend Switch, and needs a spreadsheet to keep track on all the Twinny subterfuge. 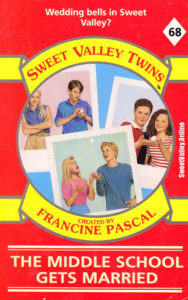 Evil twins, Wing and Dove, trade Point Horror for Sweet Valley. And they have a secret triplet, Raven, joining them for a dude’s point of view. 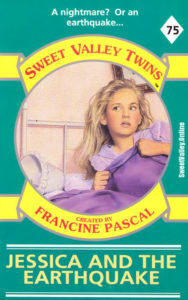 We will be recapping Sweet Valley Twins (and all the special editions, including The Unicorn Club) to start with, and if Wing survives that, we may try other Sweet Valley series. We will upload a recap every Monday for three weeks, and a podcast on the fourth. Our Podcast music is provided by Stuart Taylor of Legacy Breakfast. Sweet Valley Twins #78: Steven the Zombie on Sweet Valley Twins #28: April Fool! Powered by WordPress and based on the Shape theme using this very helpful tutorial.